My Random Muses: Don't for Get to Save your Yoplait Lids!!!! Don't for Get to Save your Yoplait Lids!!!! Yoplait lids: new this year, you can submit lids online. 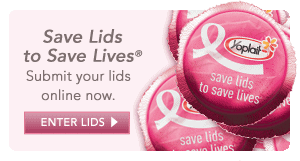 Did you know that that for every lid, Yoplait donates $0.10 to Komen for the Cure. That may not seem like a lot but the Affiliates around the country see that money and it makes a huge difference, believe me. who doesn't need a Post-it Watch???? This is Awesome! I want one in my backyard!!! !